Be inspired. Ride to honor injured veterans on Soldier Ride® Babylon. You have an exclusive chance to show your support for wounded warriors and their families by riding alongside them in Soldier Ride. Reserve your spot now on this exclusive community ride. Additionally, your contribution goes toward helping warriors recover. You help ensure warriors never pay a penny for Wounded Warrior Project® programs — since they paid their dues on the battlefield. Our free services in mental health, career counseling, and long-term rehabilitative care change lives. Suffolk County is second to none in supporting veterans, warriors, and caregivers. Soldier Ride is a long-standing tradition where you ride or cheer. There's no in between. During your Soldier Ride with wounded warriors, you will see the local main street, ocean views and a unique opportunity to ride over the huge Robert Moses Parkway Bridge to the Jones Beach area. 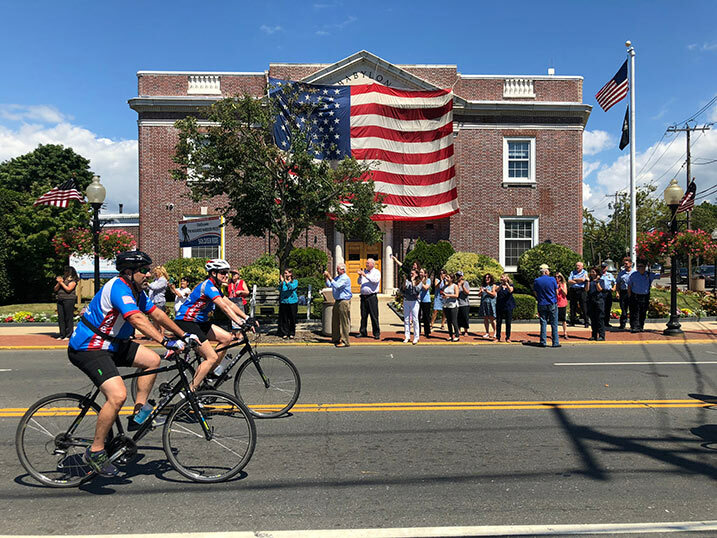 Not only do locals line the streets, wave flags, and cheer as the crowds ride by, they host and volunteer at a variety of pre-ride events to raise awareness and funds. There is even a beach-front community picnic at the conclusion of the ride. What better way to show your support for this nations wounded warriors than by registering to ride, fundraise and support during Soldier Ride. On the day of the ride, make sure to bring your bicycle, helmet, and water bottle(s). You may pick-up for your team or friend if you have their name. Download and read the safety pamphlet. You are responsible to know the rules of the road. Transportation will be provided via shuttle bus back to the starting location. A: Bibs and shirts can be picked-up prior to the event on Thursday, July 19 from 5-7pm at the American Legion, 80 Herbert Avenue, Lindenhurst, NY 11757. You may pick-up for your team or a friend if you have their name. A: Event Day Festivities, a Bib Number, and lunch. A: A Soldier Ride tee. All riders must raise $35 or more to qualify for a t-shirt. Q: Can I register the day of the event? A: Yes. Event day registration is $50, and can be paid via: cash, credit, or check. Q: Are there any promotions?